Yes, it’s time! Nominations have begun and we have a ton of exciting news to share about this year’s Model Car Hall of Fame awards. As in the 1:1 car world, this year’s edition has grown quite a bit, which means there’s even more to celebrate. If you’ve followed along so far, you know we’ve added a lot more categories this year, but that’s not all that’s new. We’ve also got a new format, a new schedule and a community now numbering more than 4.3 million to share it with, so read on and check out all the awesome additions we’ve made this year! Our nomination form has been simplified to one page, simply select the categories of your nominee and the correct form will load, then enter the information and submit! If you have any trouble submitting a nomination, please don’t hesitate to contact us. Also, feel free to share the link with anyone you know! Why so many? With such a diverse set of categories, we want a Selection Committee comprised of folks from across all the different niches that model cars have to offer. We’re working to bring onboard at least 3 selection committee members with particular expertise in every area of the hobby. With our current Selection Committee, we’re well on our way. This year, rather than a single, one evening event, which many for various reasons could not come to, we’re devoting an entire week to awards with virtual ceremonies. We want to bring even more attention to our categories to better highlight each award, plus allow a much wider audience to participate. From November 6th to the 9th, we’ll be using each day to celebrate winners and inductees from each of our major categories, holding the ceremonies online. We’ll be using Facebook live, our new Youtube channel and social media to showcase our inductees online, both live and with a recorded segment for each. This way, you’ll get a more in depth look at each winner than ever before. Of course, we owe all of this to our community. I want to thank our newest Supporters and Affiliates who spread the word and directly support the Hall, and of course thank you all for being involved! 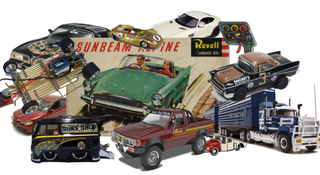 If you want to be an even bigger part of the biggest community in model cars, reach out to us here. We’re super excited to see all the amazing models, people and brands that you all have to show us. This promises to be the biggest year for the hall yet. Enjoy the ride!